Spent a little while tinkering with Maxmind’s GeoLite City geolocation database and Indiemapper’s Flash-based GIS mapping tool. 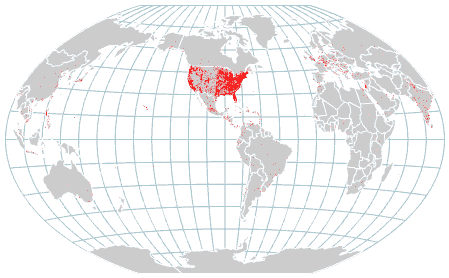 I’d prefer to render the base map myself, using the free Natural Earth shapefiles, but after deciding to use the Winkel Tripel projection with the Perl bindings for the Proj.4 library (for which the appropriate incantation appears to be “+proj=wintri +lon_0=90w +x_0=16396891.17 +y_0=10018754.17”), I ran out of idle-hacking energy when Asia wrapped around the edges. Something to do with urgent calls from a panicked customer-service manager whose migration plan had suddenly turned into a bad ending from Oregon Trail. Anyway, despite the horrible performance, excessive memory usage, and utterly crap UI of a Flash app, Indiemapper is quite useful, and for people who frequently generate maps with less than, say, 10,000 data points per layer, it’s probably worth the monthly subscription fee. It’s definitely worth the free 30-day demo. 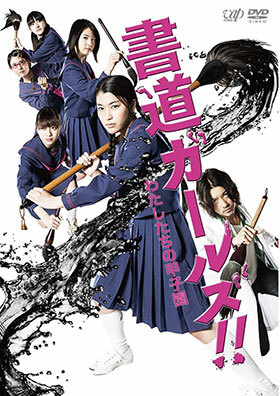 Featuring the star of Bushido Sixteen , it’s Shodou Girls!!. Popular young actress Riko Narumi often goes for a serious, intense look; fortunately her face hasn’t frozen that way, and she often looks quite cuddly. Working hard this year, too, with two TV dramas, three movies, a photobook, and several ad campaigns. According to her official site, she’s also still involved with the School of Lock! (not a typo or Engrish) radio show. “Hey, can I borrow your battleship for a few hours? And a really big fog machine?”. Tsuyoshi Nagabuchi, performing the closing song of the film Otoko-tachi no Yamato. The folks at 10gen asked me if I’d be interested in submitting a proposal for a session on MongoDB at the upcoming Web 2.0 Expo in San Francisco. Sadly, they suggested this less than two weeks before the deadline, leaving me little time to record a sample video of my legendary public-speaking skills. "All contract web developers are bling-happy assclowns with no concept of revision control or release management, who think 1,000 is a large number." Finally unlocked Griff, which gave me access to The Lapis Ruins. Also, a revelation: this game is what you’d get if you put a 7-11 and Seven of Seven in a blender and set it to “puree”. Fortunately, there’s nothing obscure about how it’s stored, and the method for stopping a particular site from ever using it again is easy. The best solution would be a small script to whitelist the few domains you’re willing to allow persistent storage from, and nuke the rest whenever they show up. Safari caches these Sqlite databases in memory during a session, so you need to restart the browser to really clear them. Reset Safari menu (clear history, reset top sites, remove webpage preview images, empty the cache, clear the downloads window, remove saved names and passwords, remove all other autofill form text, close all safari windows). Clear all non-whitelisted cookies with a custom script. Clear all non-whitelisted local storage with a custom script. Note that it’s also easy to change the data sites are stuffing into local storage. The results could be whimsical or malicious, depending on how intelligent the web developer was. On a related note, the HTML5 local database storage is in ~/Library/Safari/Databases, if you’ve allowed any sites to use it. I keep it turned off, myself. Why is Windows 7 willing to install updates and reboot a machine during a backup? Now, if this were a server, and I were running some third-party backup software, maybe you’d be able to convincingly mumble something about it being my responsibility to override the standard auto-update settings and schedule them for outside the backup window, but this is your own supplied automatic backup software on a consumer laptop. You know, the one that tries to run whenever it sees the backup drive connected and thinks now would be a good time to protect your data? Left hand, meet right hand; you two should talk occasionally. There are no circles in PDF. Thought you saw a circle in a PDF file? Nope, you saw a series of Beziér cubic splines approximating a circle. This has never been a problem for me before, and I’ve cheerfully instructed the PDF::API2::Lite module to render dozens, nay hundreds of these “circles” on a single page, and it has always worked. Then I tried rendering a few tens of thousands of them, and heard the fans on my laptop spin up. PDF::API2 is a pure-perl module, you see, and Perl is not, shall we say, optimized for trig. PDF::Haru, on the other hand, is a thin wrapper around Haru, which is written in C. Conversion took only a few minutes, which is about a tenth of the time the script would have needed to finish rendering, and the new version took 15 seconds to render a 1:50,000,000 scale Natural Earth basemap and all the data points. I ended up abandoning “circles” for squares anyway, though, because PDF viewers aren’t happy with them in those quantities, either. Still faster to do it with PDF::Haru, so the time wasn’t wasted. As a bonus, Haru has support for rendering vertical text in Japanese. I can think of a few uses for that in my other projects. 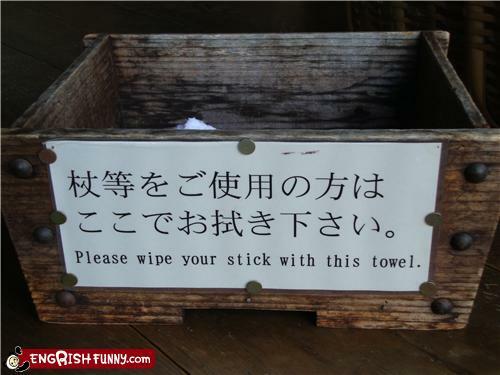 Sometimes, funny-looking English in a sign isn’t. This is a perfectly reasonable translation of the Japanese text on the sign, and I’m sure it makes perfect sense to everyone who sees it. More, please. Preferably without the bizarro zombie/mutant/drag-king who mars two of these shots. No, seriously, Kemeko, you’ve found people who know how to do your hair, makeup, and clothing, and who recognize that your talent is accompanied by severe hotness. The only thing missing is a long-overdue solo album. Again? Seriously? Dogu-chan herself wasn’t wacky enough, now she needs to be backed up by the Doguun 5 bikini combat team? SF writer Elizabeth Moon has been removed as Guest of Honor at Wiscon, for the crime of stating an opinion that disagrees with the proper view on the subject. Current sale at Costco (brick & mortar only): Western Digital 1TB bus-powered, hardware-encrypted USB drive, $99. I like this future we live in, but it still lacks catgirls. When you have a new album release that’s less than a month away, and Amazon doesn’t have the cover picture yet, and the official promotional video for one of the songs is one step up from an animated GIF, it’s time to find a new record company. Camouflage fail. On the bright side, they’re not giving you goofy hair as much in the new Hoot video. Perhaps this is your way of hiding from the stylists when they get vicious? …or at least little monsters. 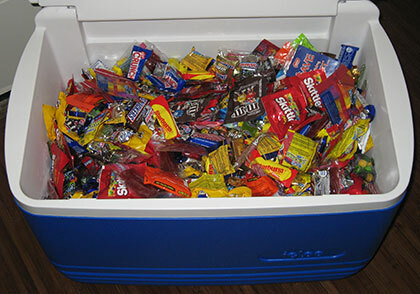 Earlier predictions for rain tonight have changed, and while it will cool down, I expect a significant number of trick-or-treaters and their attractive young mothers, so my 48-quart cooler is ready for action.